Ontario and Michigan account for more than 26 per cent of vehicle production in the Great Lakes region. 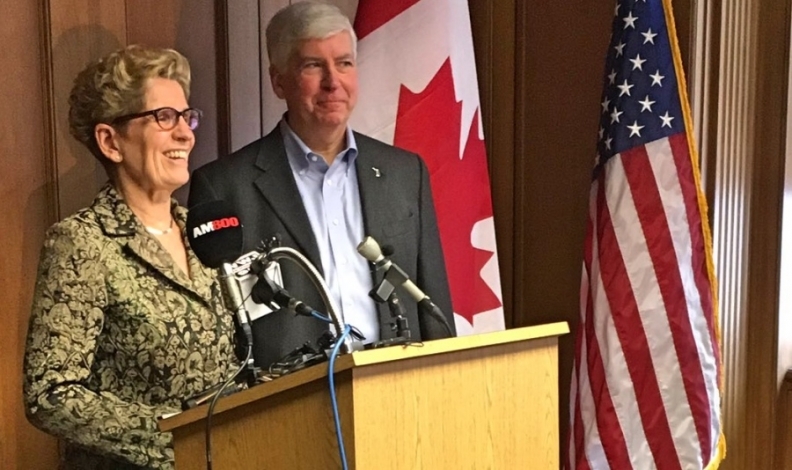 Ontario Premier Kathleen Wynne and Michigan Governor Rick Snyder met Monday to reiterate their commitment to the auto sector on both sides of the Canada-United States border. The two first met in August 2016 to sign a memorandum of understanding to increase the binational region’s competitiveness in the automotive industry. The agreement is designed to create best practices, cohesive public policy, increased supply chain integration and technology transfer agreements. Ontario and Michigan are strong trading partners with deeply integrated economies, especially when it comes to the auto industry. Ontario is Michigan's top customer worldwide, buying nearly US $21 billion in total exports in 2016. About 259,000 Michigan jobs are supported by trade and investment with Canada, more than 91 per cent of which is with Ontario. Ontario and Michigan account for more than 26 per cent of vehicle production in the Great Lakes region. Trade between the two regions in 2015 totalled US $74 billion. “Today, we discussed how we will continue to work together to advance our shared priority to create jobs and grow our economies,” the two leaders said in a joint statement. The new Canada-owned six-lane bridge will complement the aging and privately owned four-lane Ambassador Bridge. It will play an integral role in the movement of auto parts, some of which cross the border upwards of eight times before being installed in the final assembly of a vehicle. “The new bridge allows for significantly increased trade capacity, provides a real hedge against security and other related passage delays and further cements the Windsor-Detroit crossing’s status as the most important international trade link in the world,” Canadian Automotive Parts Manufacturers Association President Flavio Volpe said Monday. Wynne and Snyder met behind closed doors Monday and offered little detail as to what exactly was discussed. “Today we also reflected on progress achieved through last summer's automotive memorandum of understanding,” the joint statement said. “We are advancing our ability to develop new cutting-edge automotive technologies and improve the efficiency and reliability of our supply chains.